Spanish Prime Minister Mariano Rajoy has called on senators to approve direct rule over Catalonia, amid an escalating crisis over the region's push for independence. He said he wanted to dismiss Catalan leader Carles Puigdemont, his vice-president and all regional ministers. Meanwhile the Catalan regional parliament is holding a vote on unilaterally declaring independence. Earlier this month Catalonia held a disputed referendum on the issue. Mr Rajoy said he was calling for exceptional measures because there was no other choice and said "law, democracy and stability" needed to be returned to Catalonia. He accused the Catalan government of dividing families and fracturing society. Many people had already suffered too much, he said, and the uncertainty was driving businesses out of the region. What powers does Catalonia have? "The thing that Catalans need protecting from is not what they're calling Spanish imperialism, but a minority who, in an intolerant way, declare themselves the owners of Catalonia and consider as exclusive a history, culture and feelings that are the heritage of the community," he said. 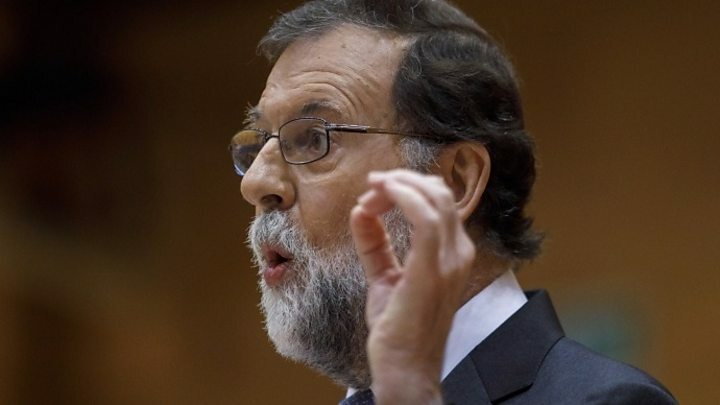 The speech was met with applause in the Spanish Senate, where Mr Rajoy's Partido Popular has a majority. Article 155 of the Spanish constitution empowers the government to take "all measures necessary to compel" a region in case of a crisis. It would enable Madrid to take control of Catalonia's finances, police and public media. Media captionStudents with Catalan flags chanted "independence"
The Senate is expected to back his proposals, which also have the support of opposition parties. The Catalan parliament could respond by declaring independence unilaterally. However both bodies have allowed for further debate on Saturday. The regional parliament in Barcelona is voting in a secret ballot on declaring independence from Spain after a heated debate. On Thursday Catalan leader Carles Puigdemont failed to reveal a favoured course of action, and called on MPs to decide on a response. 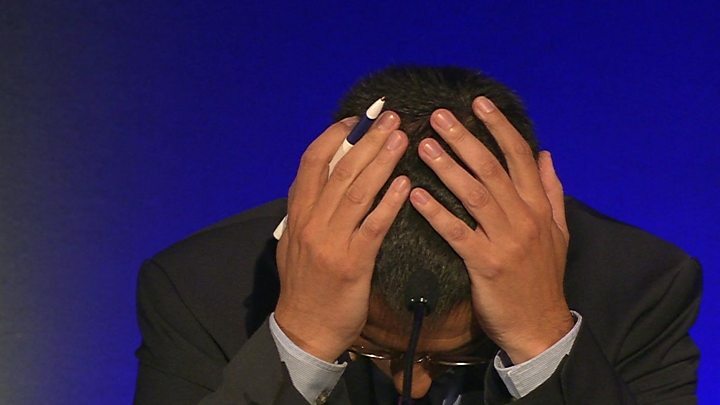 Pro-independence MPs have drafted a motion in favour of declaring independence from Spain. But Carlos Carrizosa from the anti-independence Citizens's Party, who was first to speak in Friday's session, said the text would "destroy what we hold most sacred, living together in harmony". Pro-union parties are boycotting the vote. Mr Puigdemont signed a declaration of independence following the 1 October referendum, but immediately halted implementation and called for negotiations between Catalonia and the Spanish government. The Catalan government said that of the 43% who took part in the referendum, 90% were in favour of independence. But the Constitutional Court ruled it was illegal. Were reports of Catalan violence fake? Article 155 of Spain's 1978 constitution has never been used before in democratic Spain. And for good reason. Spaniards call it their government's "nuclear option". But the Spanish Senate is expected to vote in favour of triggering Article 155 and stripping the region of Catalonia of its autonomous powers. The move is the only way, the Spanish government insists, to calm the Catalan crisis. 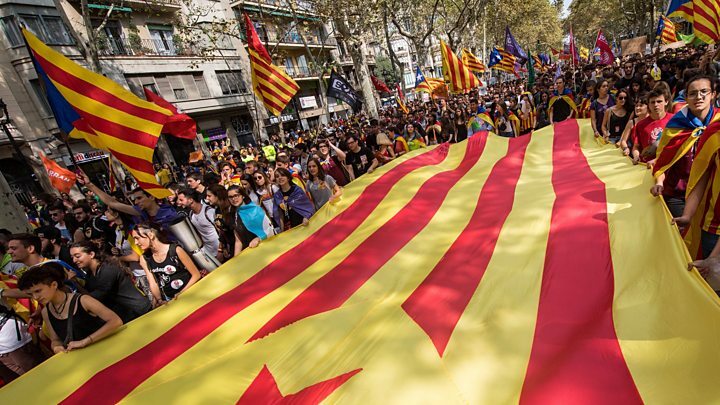 But Catalan leaders say such a move will simply add fuel to the fire - making it more likely that Friday will be the day that they officially declare an independent Catalan republic. Friday's front page headline of Spain's Barcelona-based newspaper El Periodico tells the story. It reads: "Unilateral Declaration of Independence and Goodbye." Catalonia: What powers does the region have?